Find out about the different sections of the HEAR and what appears in them. If you have a question which is not answered below, please get in touch with us via email at hear@plymouth.ac.uk. The following descriptions show what appears in the different sections of a HEAR. Please refer to the mock HEAR report to see an example of each section. Basic student details, such as name, student reference number and date of birth. Qualification details such as name of qualification, main field of study and name of awarding institution (i.e. The University of Plymouth). 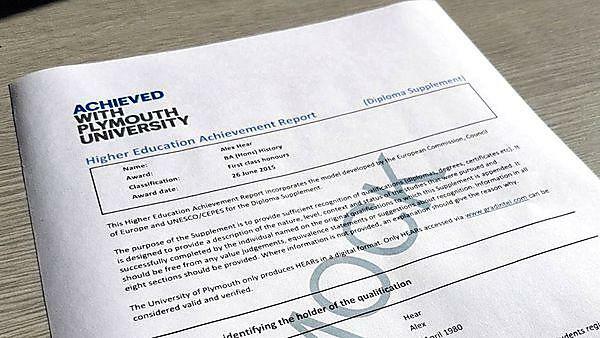 Level of study, duration, and a link to the Plymouth University website for searching for entry requirements. Please note: Section ‘3.1 - HESA level of qualification’ will sometimes display ‘First degree with honours’ next to it if this is your first degree. Please be aware that this is not the achieved result, but is the HESA level of qualification. It will show the same text regardless of the overall final classification on the award. The final achieved result (once the course has completed) will show in section ‘4.5 - Overall classification of the qualification’. Details on the programme description/details, individual grades/marks/credits obtained, grading scheme and overall qualification result. Please note: Only modules which have been passed will show on the HEAR. Any modules which have not been passed will be omitted. A link to the Plymouth University website for accessing information on further study and professional status (if applicable). Please be aware that for an activity to appear in section 6.1 of the HEAR it needs to adhere to the following policy: Protocol for Recognising PU HEAR Section 6 Achievements. Date of award, Vice-Chancellor’s signature and Plymouth University seal. Description of higher education in England, Wales and Northern Ireland, diagram of higher education levels. If you have a question which is not answered by the above descriptions or the information found in the FAQs, please get in touch with us via email at hear@plymouth.ac.uk.